Its key location within the Resort and its geographic location, make it the ideal destination to enjoy a good holiday at any time of the year. 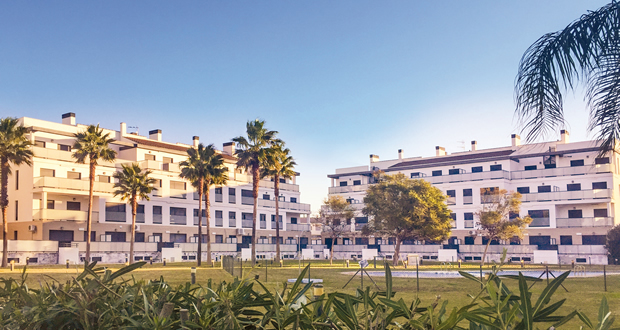 Las Dunas consists of 39 bungalows with parking included and 176 apartments distributed around a large green area with swimming-pool. All of them are fully furnished, the kitchen comes fully equipped and, moreover, there is air conditioning in allrooms, satellite TV with international channels apart from the national DTTV and free Premium Wi-Fi connection. The most out standing features of the residential are the services offered to its guests: reception, security, coveredgarage, bar and restaurant, take-away service, technical service, laundry, etc. Moreover, guests will also be able to disconnect from daily routine thanks to the facilities available at Las Dunas: 3 communal swimming pool, 1 indoor pool, gym, paddle court and playground. Every thing brought together to offer a pleasant break toour guests.